These high tea recipes go back to my mother’s childhood and are fun to make as well as to eat! Afternoon tea or low tea is what Americans picture when they think of tea time: tea served with light snacks such as crustless sandwiches, crumpets and scones. This custom originated among the upper classes, as they had both the time and the money to have an extra meal between lunch and dinner. High tea, on the other hand, is a full meal served with tea, including meat, bread, side dishes and dessert. It always makes me think of The Famous 5 or Swallows and Amazons, lashings of ginger beer and a fantastic spread of seed cake and quiche. Smashing! What better way to spend the afternoon when you have a houseful of kids on a sunny afternoon. I always like to eat outside on a gingham tablecloth with more food than we can mange to stuff down. Here are my favorite selection of high tea recipes - enjoy! 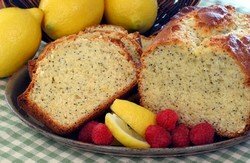 Lemon Poppyseed Cake - This cake is wonderful served up with butter and hot English Breakfast tea. Smoked Salmon Quiche with Dill Pastry - This recipe is quite rich and packed with wonderful flavors – my kids go nuts for it! This is one of the my family's favorite high tea recipes. It is wonderful served up with butter and hot English Breakfast tea as part of a fabulous high tea. It seems very plain but I guarantee that there won’t be a morsel left at the end. The deep cleft down the middle of the cake is alluring and if you want to jazz it up - add a drizzle of lemon icing (juice of a lemon, icing sugar and a little water). Step 1: Preheat the oven to 170 degrees. Step 2: Cream together the caster sugar and butter. Step 3: Stir in the lemon zest. Step 4: Add the eggs – one at a time, and stir in a large spoon of flour with each. Step 5: Mix in the remaining flour and the lemon juice. Step 6: Scoop into the greased loaf tin and generously dust with caster sugar. Step 8: Cool in the tin, then turn onto a wire rack. Step 9: Serve sliced with strawberries and cream for an extra-delicious high tea treat. This is quite rich and packed with wonderful flavors – my kids go nuts for it! Step 1: Mix the flour, dill and butter until crumbly. Step2: Add the egg yolk and 2 large spoons of water. Mix into a dough. Step 3: Using floured hands make a ball and put the pastry into plastic wrap and refrigerate for 30 mins. Step 4: Roll out, fit into the greased tin and trim the edges. Put back into the fridge for 10 minutes. Step 5: Preheat the oven to 190 degrees and bake blind for 15 minutes: with beads and greaseproof paper. Then remove the beads and cook for a further 10 minutes. Cool. Step 1: Reduce the oven to 180 degrees. Step 2: Gently fry the onion in the butter until soft. Step 3: Stir in the lemon juice and herbs and then add the salmon. Step 4: Mix together the egg and cream and season. Step 5: Lay the salmon onto the pastry and pour over the cream and egg mixture. Step 6: Bake for 25-30 mins. Serve warm with salad and new potatoes for a hearty high tea.